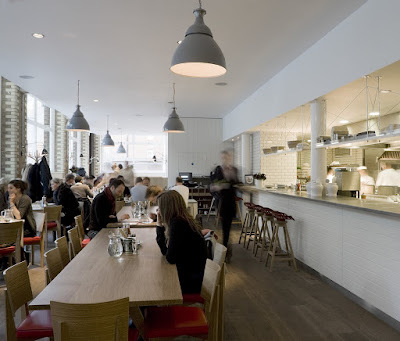 On of the latest additions to the uber-trendy Redchurch Street in London's East End, the Albion Caff, Sir Terence Conran's latest creation, is a 'traditional British Cafe' with a stylish twist. Whilst there are lunch and evening menus, breakfast, served throughout the day, is certainly the raison d'etre of this establishment, and though it's slightly more pricey than your local greasy spoon it makes up for it with a pleasant atmosphere and good ingredients and it is certainly a winning combination at present. When your author visited, for breakfast on Good Friday, the cafe was packed with the usual East London clientelle of people who have put a bit too much time into their hair and clothes, but the atmosphere was relaxed nonetheless. So relaxed, in fact, that the tea and hot cross buns took his table well into the lunchtime slot, which the staff seemed to accept without question, to their credit. The Albion also has a small shop, which staff maintained was open until midnight daily, stocking a range of the sort of upmarket groceries and baked goods which should ordinarily only be considered for the 'present' or 'special occasion' markets. Your author anticipates, however, that as it is local he will soon be drawn into paying for at least a few items in the range of produce on offer, some of which even comes from Barton Court, Terence Conran's country home. For more information on the Albion, why not visit the website at http://www.albioncaff.co.uk/.